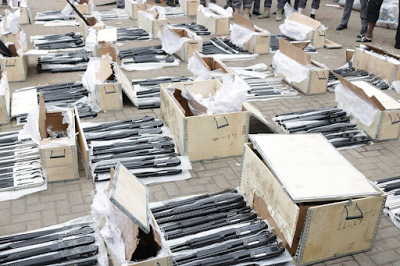 Officers and men of Nigeria Customs Service, FOU Zone A, Ikeja intercepted 661 pump-action rifles concealed in a container on Monday, January 30th. 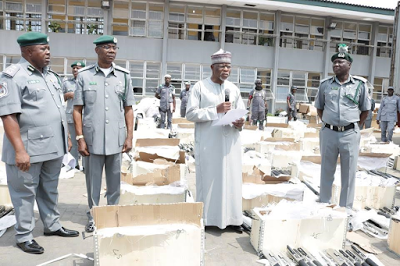 Below is the briefing by the comptroller-General of Customs, Col Hameed Ali. 3. 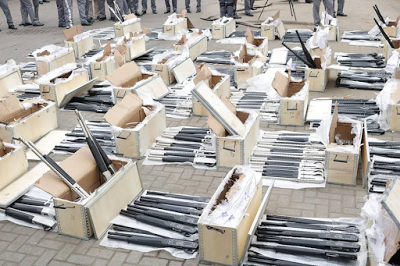 These Rifles are under absolute prohibition; therefore its importation is illegal. Such deadly contravention of the law is even more unacceptable considering the fragile security situation in some parts of the country. 5. Investigation has already commenced and I have directed that the drag net should be wide enough to fish out all persons involved in the importation and clearing of the consignment. Already, the Officers involved in the clearance of this container are with the Comptroller FOU Zone ‘A’Ikeja. 6. This seizure underscores the determination of the Serviceto enforce all laws relating to importation and exportation of goods into and out of Nigeria thereby contributing to the economy, security and wellbeing of the Country. 7. This feat is no doubt commendable and represents the new normal in the service where most Officers and Men are on a daily basis ensuring that illegalities are not allowed unchecked. I commend the Comptroller, all Officers and Men involved in this great seizure. 8. Let me seize this opportunity to call on all well meaning Nigerians to support the service with information that could assist the Service perform their statutory responsibilities in the interest of our father land. 9. Thank you for your attention.